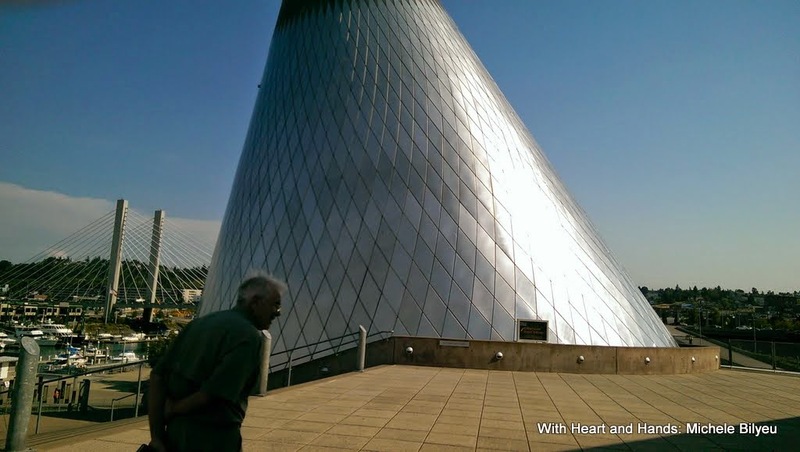 We've just returned from a visit to the beautiful city of Tacoma, WA. With a name adopted after the nearby Mount Rainier, which was originally called Mount Tahoma, it is known as the "City of Destiny". 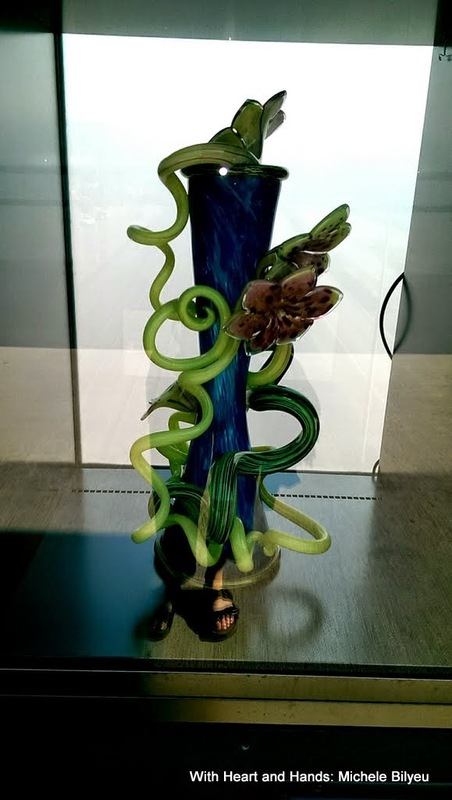 From the amazing 'Bridge of Glass" and the unbelievable "Venetian Wall, to the "Museum of Glass" and its amazing "Hot Shop", to giant glass sculptures, every where we walked or turned, there was another amazing piece of art! 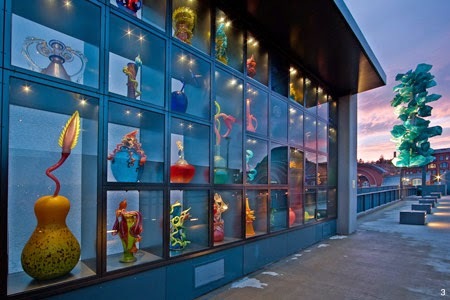 A partnership between the Museum of Glass, legendary Studio Glass pioneer Dale Chihuly and the city of Tacoma resulted in the Chihuly Bridge of Glass, a 500-foot-long pedestrian overpass that links the Museum to downtown Tacoma and its cultural corridor. 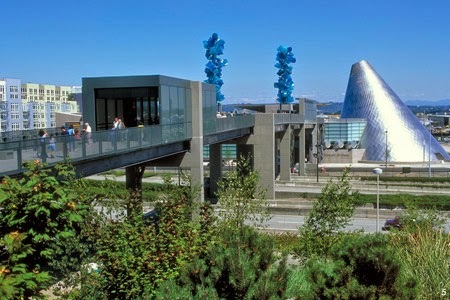 The bridge provides a means for the internationally-renowned Chihuly to contribute in a very public way to his hometown. 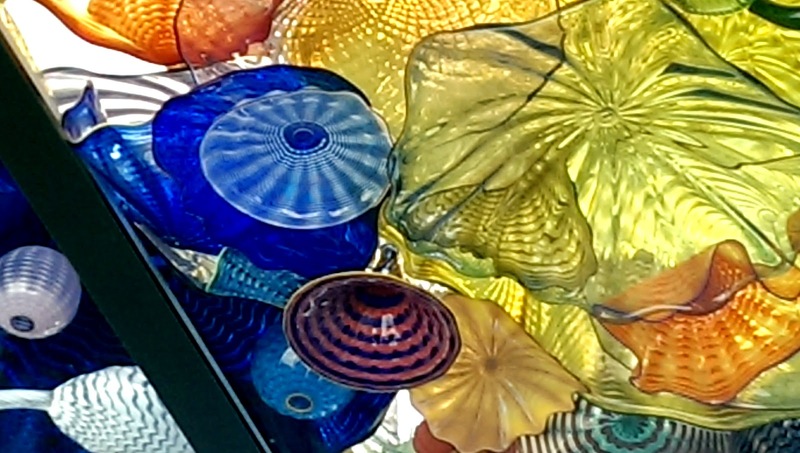 Three distinct installations comprise the Chihuly Bridge of Glass. 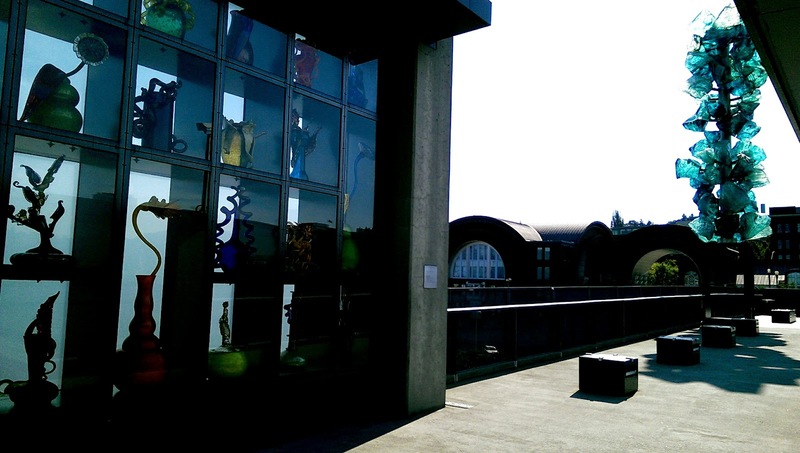 The bridge is the gateway that welcomes people to Tacoma. 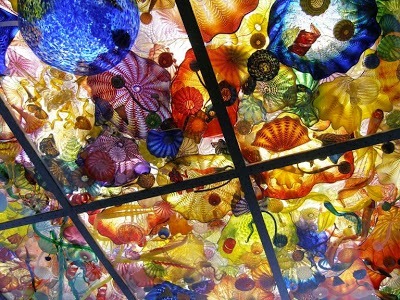 The Seaform Pavilion, is a ceiling made of 2,364 objects from Chihuly's Seaform and Persian series. 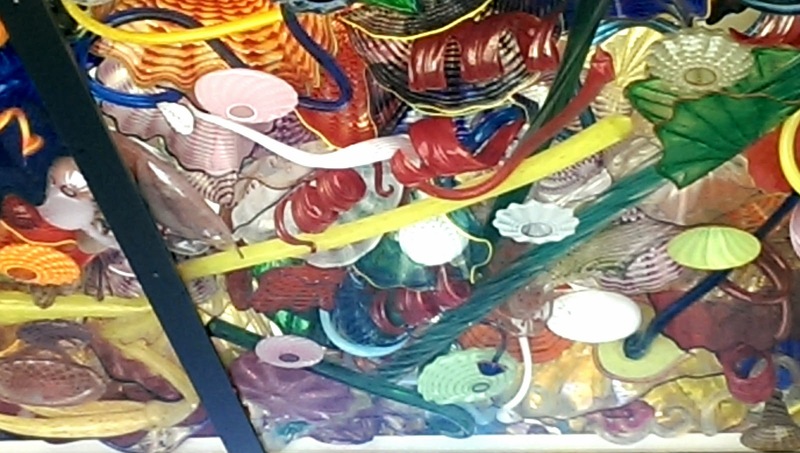 Placed on top of a fifty-by-twenty-foot plate-glass ceiling, the forms are suspended in midair. 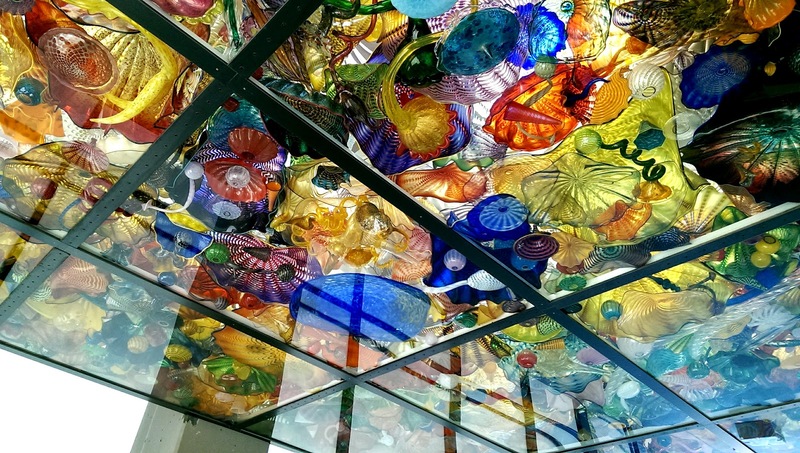 As we walked under this pavilion, we experienced a seemingly underwater world of glass shapes and forms a few feet above our heads. 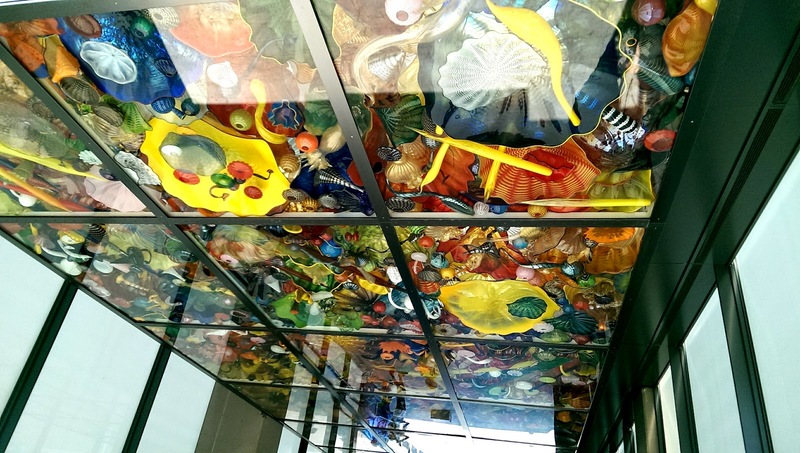 This was our entry onto the Bridge of Glass and then on to see the Venetian Wall, with all of its amazing blown glass vessels of intricate delicacy and beauty. The Venetian Wall is a collection of some of the largest blown-glass works executed in the history of the medium. 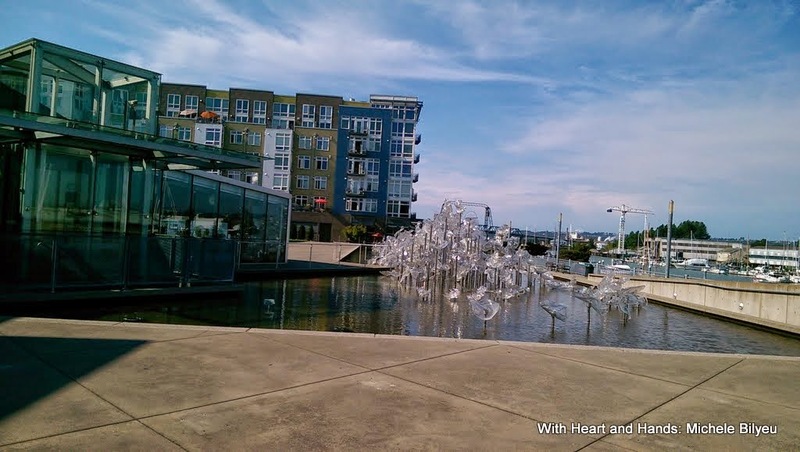 It is an eighty-foot installation displaying 109 sculptures from three of Chihuly's series: Venetians, Ikebana, and Putti. 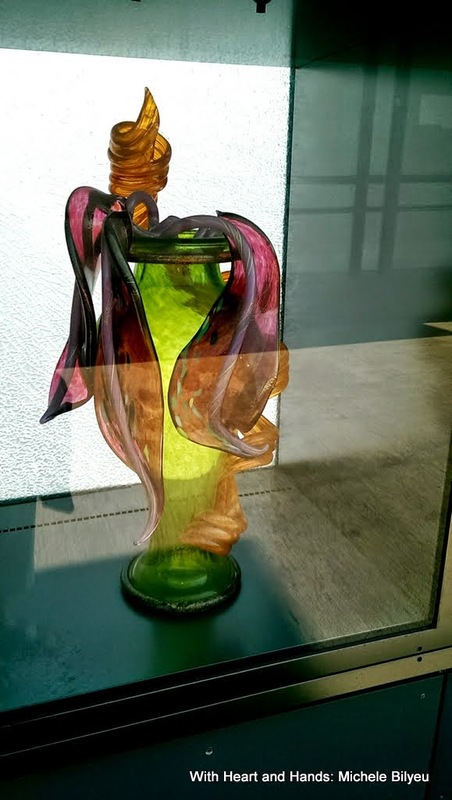 The Venetians are exuberant sculptures with origins in Venetian Art Deco glass. Ikebana are quiet pieces, created in the spirit of traditional Japanese floral arrangements. Putti were popular figures in European art of the sixteenth and seventeenth centuries and represent Cupid, the Roman god of love. The wall ends but the beauty continues. Marking the center of the bridge are the Crystal Towers, two amazing twin columns, which rise forty feet above the bridge deck and serve as beacons of light for the bridge and city. Illuminated from below, the forms glow at night. 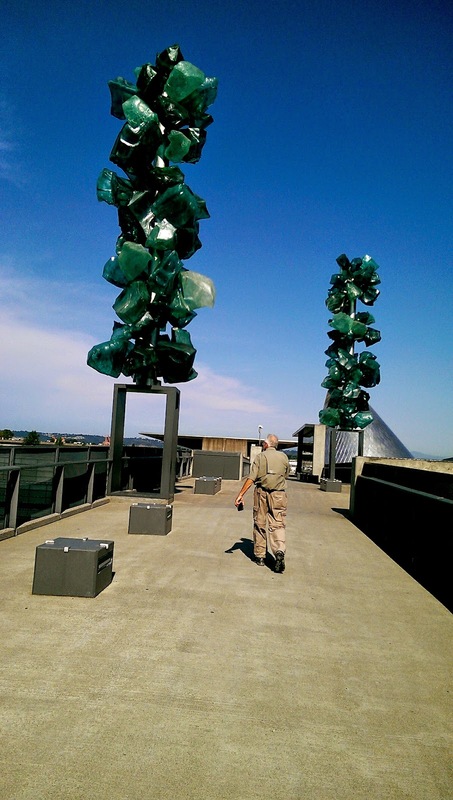 The 63 large crystals in each tower are made from Polyvitro, a polyurethane material developed to withstand the elements. 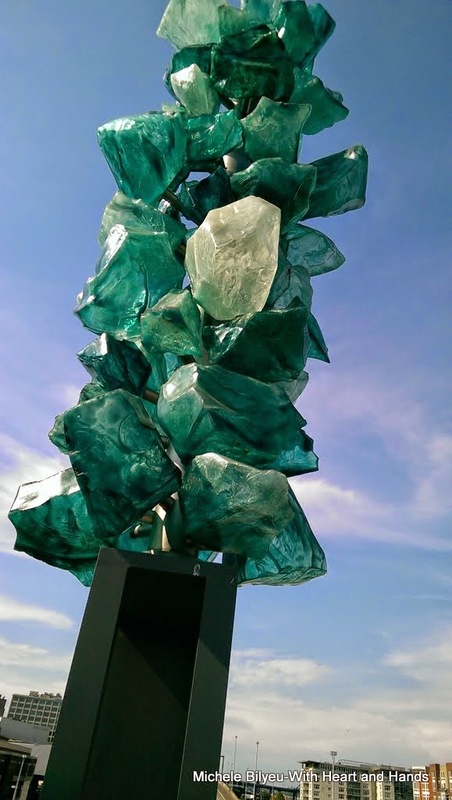 As the website for information states: "The Crystal Tower elements are raw, brutal forms, monumental and bold, that appear as if cut from mountain peaks or taken from frozen alpine lakes." 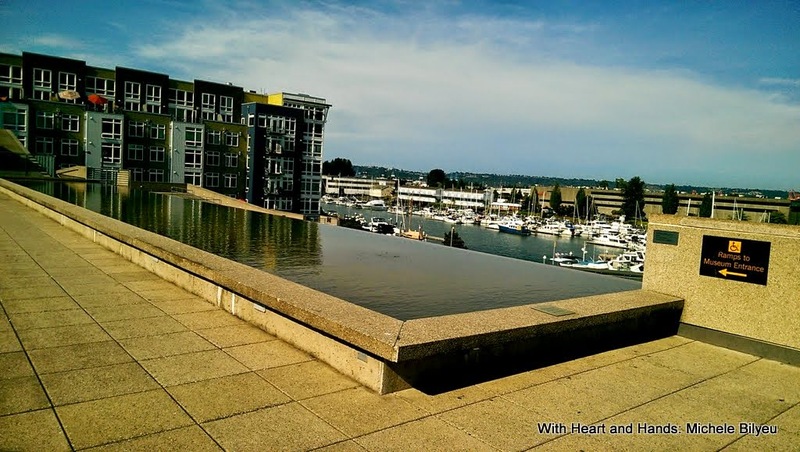 When looking out at the marina, we see how Commencement Bay connects land to sea and why the city's motto became "When rails meet sails." A center orignally for commerce, it has become a growing city of many distinct and varying sections with old growth merging unexpectedly into the new. But even more meaningful to me, was it's status as having more art and history museums than any other area in the state. 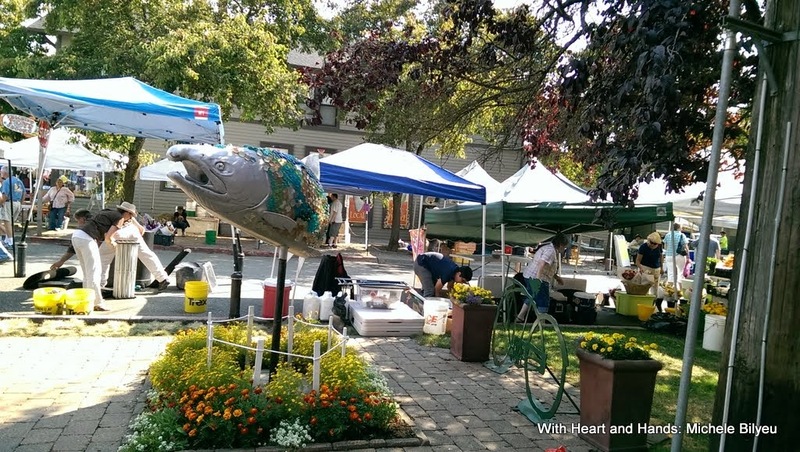 Arriving in Tacoma for a family wedding, we immediately began a walkabout and almost instantly were entranced by beautiful artistic creations everywhere we looked or turned. 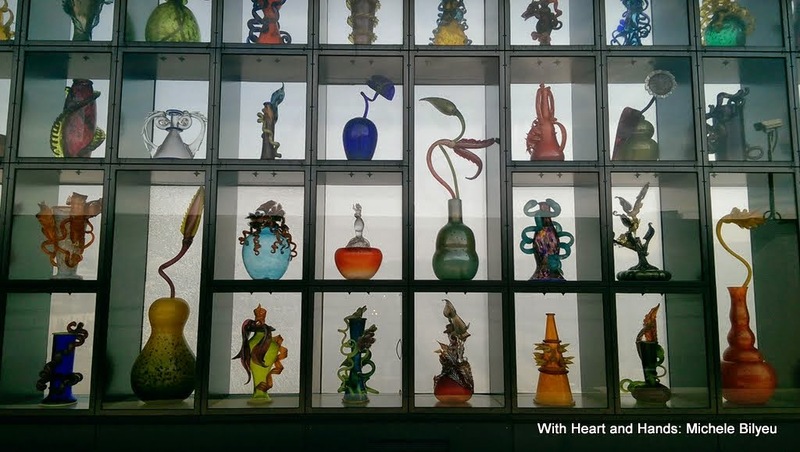 If mere mortal wo/man is a vessel of clay, then these vessels of glass are of the most transcendent level imaginable! 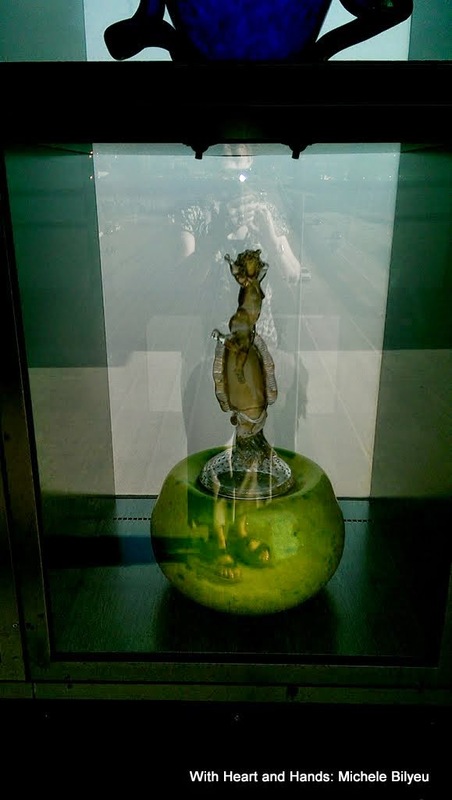 The light was so bright, and the tunneling roof of the bridge cast shadows, and of course, people were trying to see and to take photos all along its length, but I tried to capture just a few of the amazing glass forms that truly seemed to take on an unearthly form of their own. 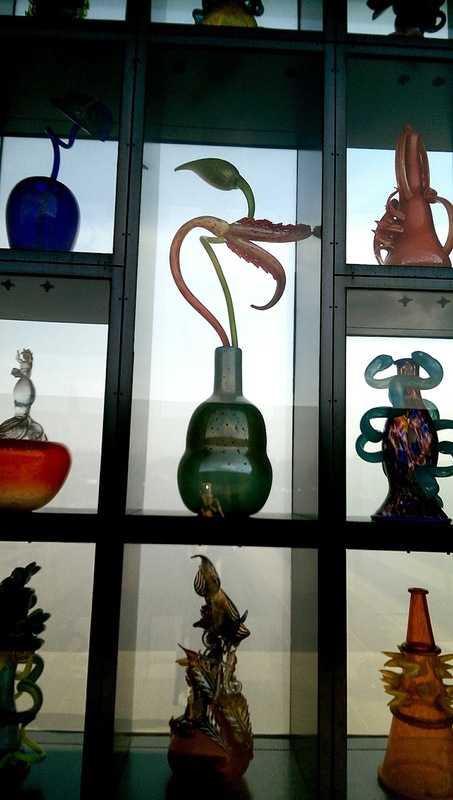 Like the glass ceiling of sea forms, these almost seemed alive in their own unique way!! Such beauty and great imagination and talent. I loved all of it and learned anew that beauty of cloth is much of the earth, but beauty of the imagination is so far above and beyond.... I could only drink in the wonder of it all. 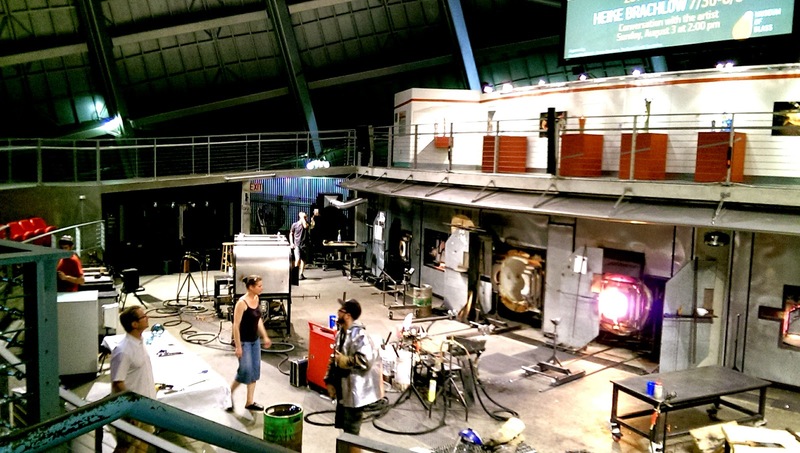 We discovered this amazing cone shaped building which houses the "Hot Shop" for glass blowing. Here, up on the very top deck, we could finally see it, in all of its glory. 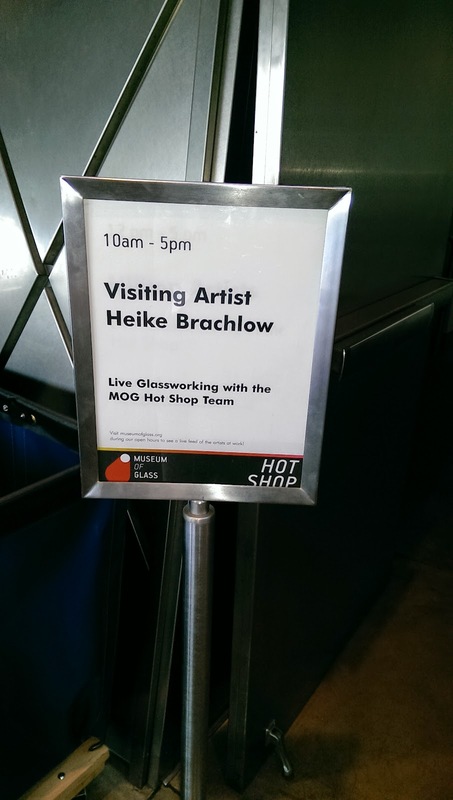 This week it was visiting artist, Heike Brachlow. 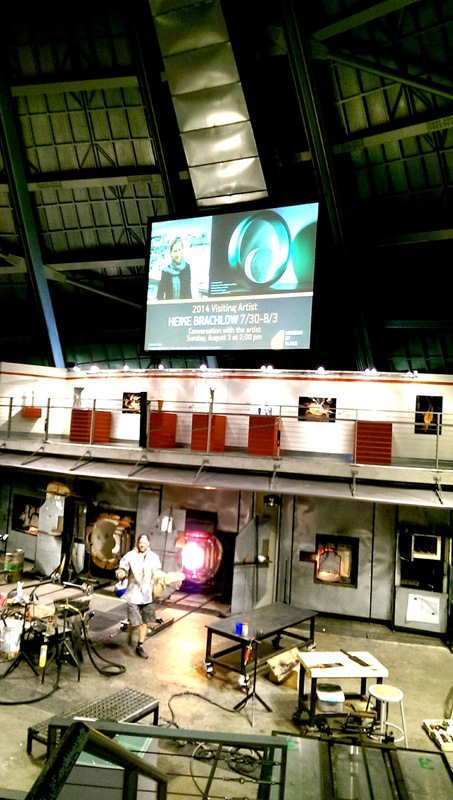 It was just 5 minutes from closing, but I snapped photos of the Hot Shop staging area as quickly as I could, and it was an amazing experience seeing glass blowing in real life and not just on Public Broadcasting specials! 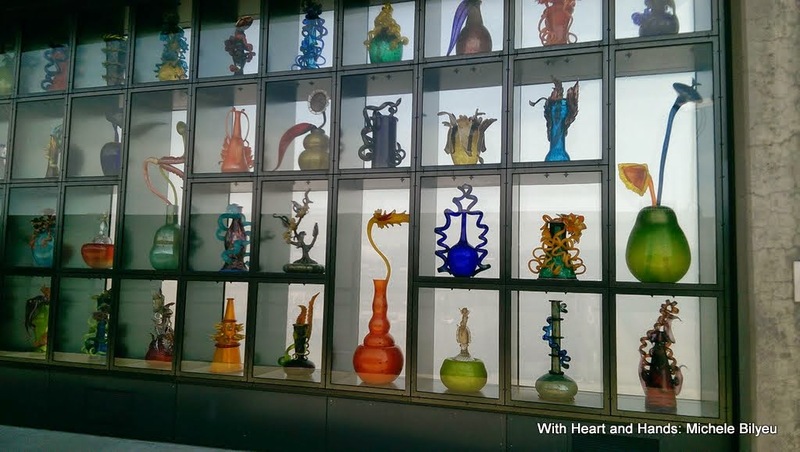 Besides the Chihuly Bridge of Glass, the Ventian Wall, and the Hot Shop, there were glass sculputures everywhere along that area. With the backdrop of the marina, it was simply breathtaking! 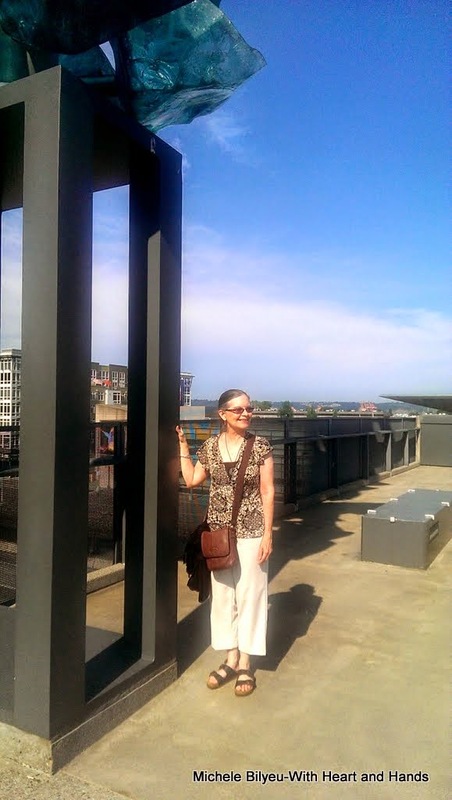 And then, with only my phone's bookmarked link to my search for "Free Things to do in Tacoma" we simply fit in one amazing adventure into another, while still attending a heart felt wedding of my nephew and his new bride at a beautiful overlook at the Pt. 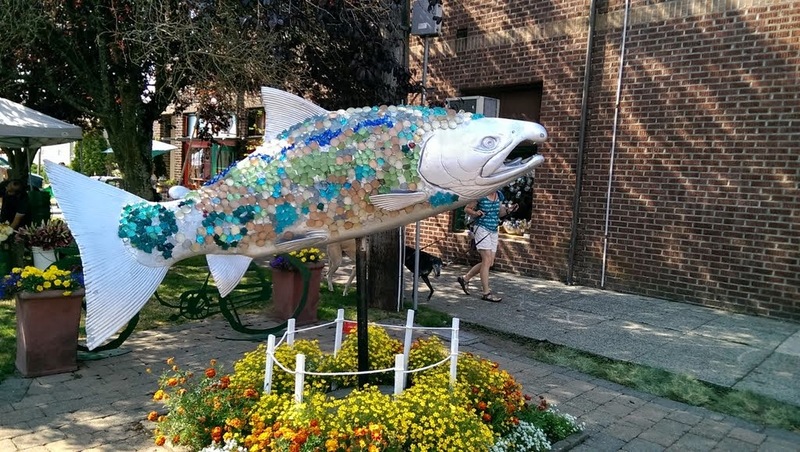 Defiance Zoo and Aquariam, with trips around the 5 miles loop of the Pt. 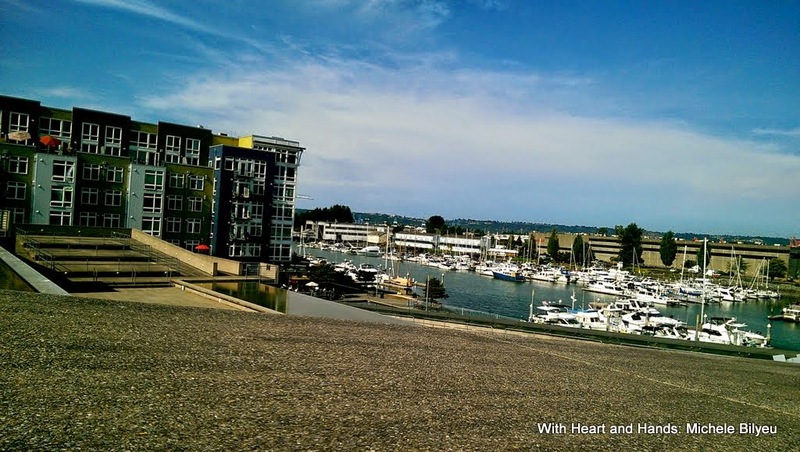 Defiance Park, itself, and long vistas of the beauiful sailboats, para-sails, and walkways along the Tacoma Waterfront. 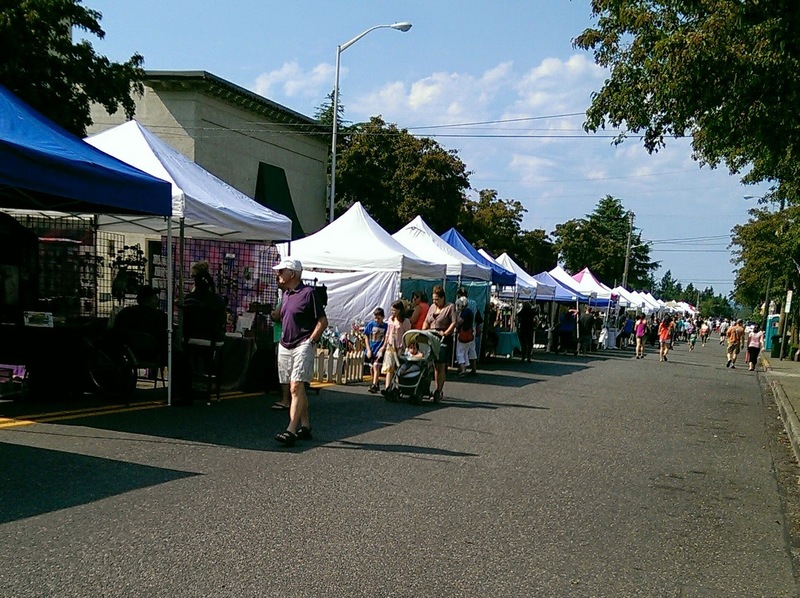 And in just a few minutes of spare time, we discovered a really fun arts and crafts sidewalk market in the middle of a little neighborhood! 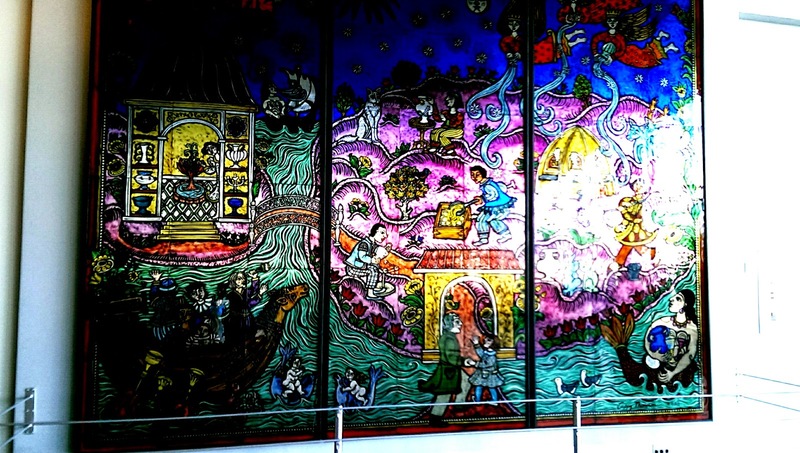 Beautiful art everywhere we went or looked. Much of it by nature, herself, but a lot inspired by that beauty and transformed by man into works of art and beauty unimaginable! 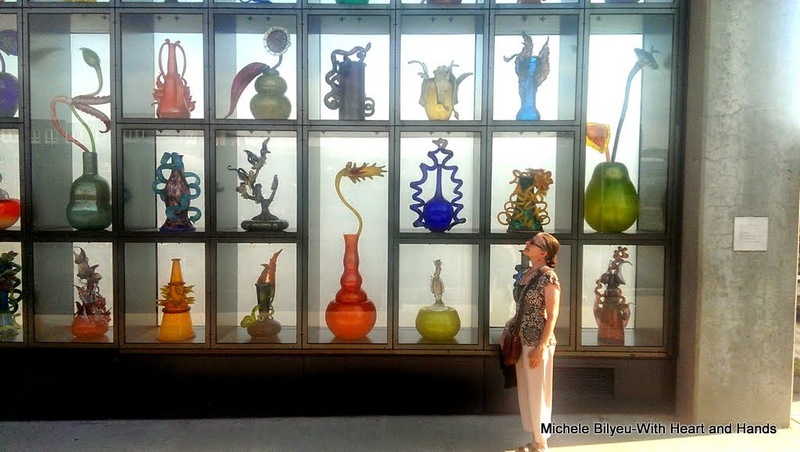 Michele _ I so love glass work. 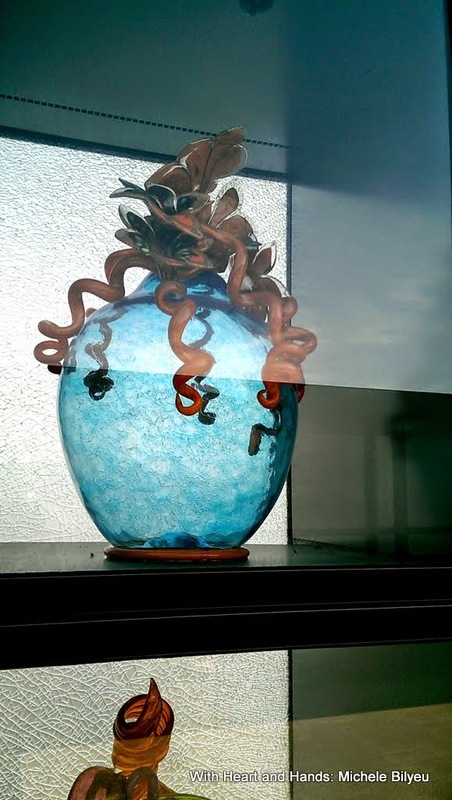 We once went to Venice and saw some glassblowing there - it was Murano glass and I brought back a small paperweight to remember that part of our journey. 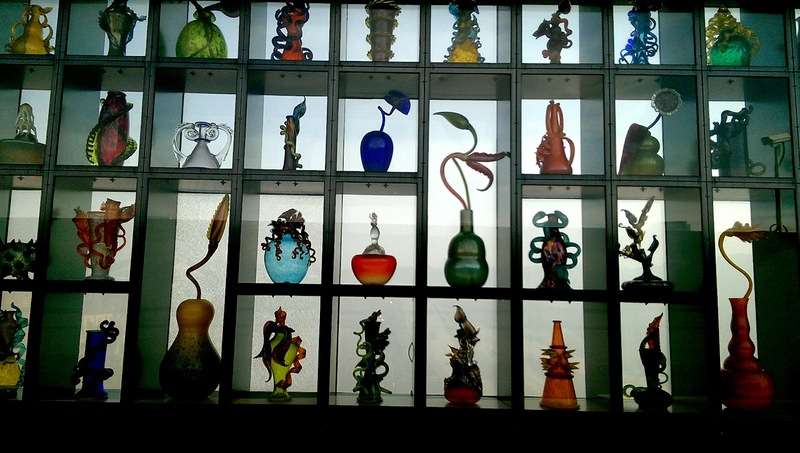 What a fascinating and beautiful place Tacoma is- thanks for sharing all the beautiful glass pieces. 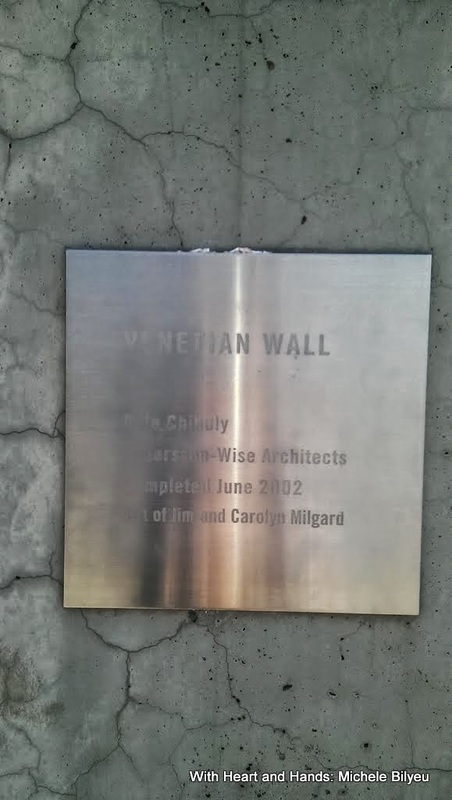 The pedway is amazing as are the sculptures.. I am sure that the wedding was fabulous too. Oh Michele!!! 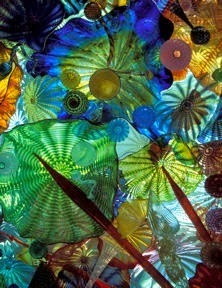 I love Chihuly's work....every piece is stunning. I'm so glad you were able to see so much on your trip. I had the very good fortune of meeting Dale once. 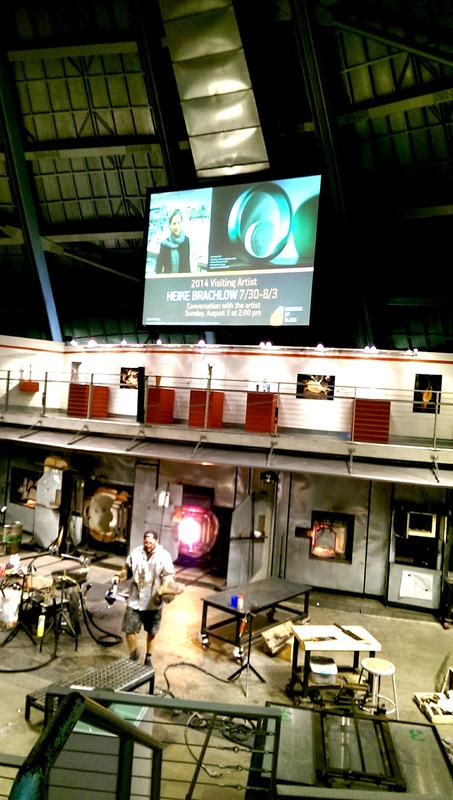 I asked him if it bothered him to ship such amazing pieces around the country. He said, "No." If one gets broken, I make another....gotta love his attitude! Some beautiful and stunning photos!